...a Severe Thunderstorm Warning Remains In Effect Until Noon Cdt For East Central Kerr...southeastern Gillespie And Northwestern Kendall Counties... At 1130 Am Cdt, A Severe Thunderstorm Was Located Near Cypress Creek, Or 9 Miles North Of Comfort, Moving Northeast At 40 Mph. Hazard...quarter Size Hail. ...Read More. Home News Part One: Simply the Best! GRAPELAND – When Rick Frauenberger holed out on the 18th green on Tuesday, there was no doubt. The Grapeland Sandies were the 2017 Class 2A State Champions in golf! The Sandies finished with a two round total of 600 which put the team 53 shots ahead of second place and set a new conference 2A record. They are simply the best! On Thursday, the team made up of Josh “Bear” Ackley, Case Boyd, Brayden Cheatham, Riley Chipman, Rick Frauenberger and Coach Cannon Earp sat down with The Messenger to discuss their state championship and what it means. “We had been keeping up with the competition and looking at scores all year. We knew if we continued to play the way we had, we would have a chance. 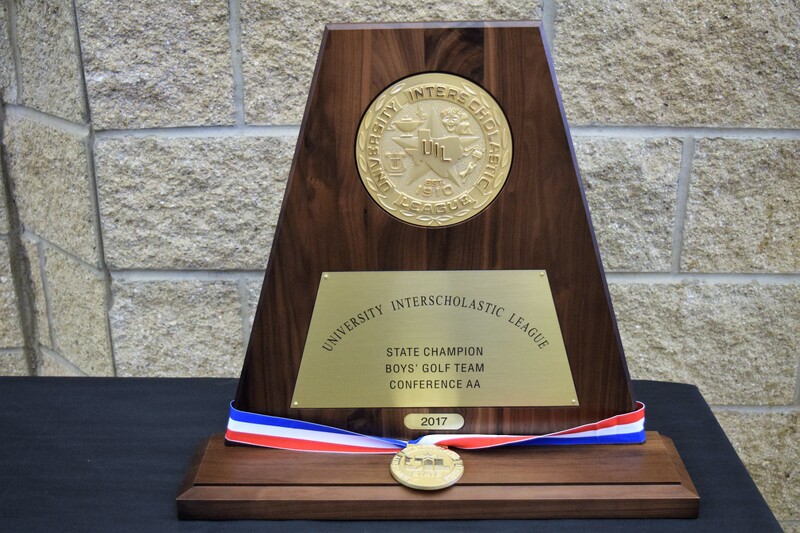 Honestly though, I think in the back of my mind and in the back of their minds, I think they wanted to beat Normangee’s score from last year,” the coach said. When asked what his thoughts were before he hit his first tee shot, the only senior on the team – Chipman – smiled. “I thought to myself this would be the last year I would be at the state tournament and I wanted to leave with a state championship. I also wanted to get the first hole out of the way,” he said. Frauenberger, who won the individual gold medal as the low scorer, recounted the first day’s finishing hole. “I was pretty nervous on the tee box. It’s a tough driving hole. I wanted to finish strong with either a par or a birdie and I wound up making birdie,” Frauenberger said. Monday’s opening round saw Boyd, Cheatham and Chipman all finish with a 79. On day two of the tournament, Boyd shot a 41 on the front nine but then finished with a 37 on the back nine. “I think my focus changed around the greens. I started to aim for the center of the green and not to be so aggressive with my approach. It took me a while to get my swing going,” Boyd said. Cheatham, who tied for the low score of the day on day two with a 69, was asked if he changed anything from the first round to the second. “Not really. I just hit the ball a smidgen better and my putting was a lot better. I made the putts I missed in the first round,” he said. Chipman carded an eight on the par-3 15th hole in the second round and said he was still mad at himself when he got to the tee box on 16. “I pulled out my driver on 16 and hit it straight at the bunker. I thought it was in the sand but when I got up there, it wasn’t. My second shot, I hit it on to the green and made the putt. So, I went to 17 and hit my tee shot and it hit the cart path. I thought it bounced into the water but I managed to stay out of the water, hit my second shot and made birdie on 17. So, I went 8, birdie, birdie. I had a chance for another birdie on 18, but I missed the putt,” Chipman said. With a five stroke lead after the end of Round 1, Frauenberger was the last golfer to tee off in Round 2. Asked if he felt any nerves as he was finishing up, Frauenberger said he started to get a little anxious on the 17th hole but it really began to sink in on 18 because of a backlog of players. “The 18th is a tough hole with hazards all down the left side and a bunker down the right. There were a lot of rulings going on ahead of us with people having to take drops. It’s one of the hardest holes on the course and it’s a bad spot for there to be a back-up,” the coach explained. The Sandies saw their overnight lead of 24 begin to balloon as the second round continued. “We knew that 24 strokes would be hard to make up and if we could all shoot in the 70s, we felt like we would win,” Chipman said. Boyd said he was focused on beating the Normangee score (602) from 2016 and never let up through the final holes. “I was just trying to get back into the top 10. My freshman and sophomore years, I was seventh and eighth. I was trying to do better than that and wound up fifth,” Cheatham said. “A couple of the guys asked me if they should dogpile Rick because he was the last one to finish. They didn’t know if they were supposed to celebrate or give a little golf clap and go on,” Earp laughed. “I really do think it was important, like Case said, to shoot a certain score. Golf is a very mental game. If you’re playing not to screw up, a lot of times you do screw up. I think having a score to shoot at was a big deal,” he explained.